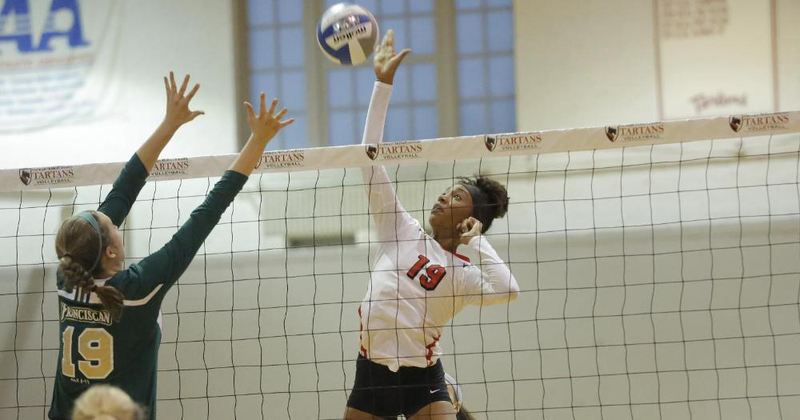 Last weekend, the Carnegie Mellon women’s volleyball team entered the Carnegie Mellon Mini Invitational with a 19–5 record. After defeating Messiah College the day before in three sets to one, the team faced off against Elizabethtown College’s Blue Jays in their first match of the day. The Tartans began the match strong, winning the first point and controlling the flow of the game from the start of the set to the end. However, the Blue Jays refused to allow the Tartans to run away with the set, fighting back with firm defense and strong digs. Carnegie Mellon continued with their great all-around play, dominating the set and amassing a 10-point lead. The Tartans built on their lead and went on to win the set 25–11. Coming out of the break, the Tartans didn’t lose any steam and quickly gained a 9-point lead on Elizabethtown with powerful serving and offense. The Blue Jays’ play improved from the first set. Though they lost some momentum with two service errors, they immediately regrouped to cut the Tartans’ lead to 4 points with strong turnaround in serving. Carnegie Mellon resisted the comeback, however, preventing Elizabethtown from taking the lead at any time during the set. The Tartans won the set, 25–17, improving the series record to 2–0. The first point of the third set went to Elizabethtown, their first lead in the match. Again, their play improved from the previous set and the Blue Jays maintained their lead, showing their diligence and clutch play when it mattered most. The Tartans returned to their dominant and aggressive style, taking the lead following senior libero and defensive specialist Molly Higgins’ strong serving and taking advantage of the opposing team’s multiple service errors. During the middle of the set, the teams traded points, serving back and forth. Carnegie Mellon rallied, surging to match point, but the Blue Jays refused the Tartans the victory, forcing a second match point. The Tartans won the next volley, finishing the third set 25–21 and winning the match in straight sets. The Tartans hit .318 as a team with senior middle blocker Jackie Gibbons leading the squad with a .611 hitting percentage. Gibbons put down 11 kills with no errors. Sophomore outside hitter Lauren Mueller had seven kills while senior middle blocker and outside hitter Casey Salandra had four. Senior setter Emily Newton picked up 28 assists with first-year setter Maia So-Holloway collecting four assists. Higgins led the team with 13 digs. Gibbons and senior right side hitter Kristen Flint had three and two block assists, respectively. The Tartans went on to win the third and final match of the invitational against Rochester in straight sets, completing the invitational with a 3–0 record and improving their overall record to 22–5. With their strong offense, defense, and cohesive teamwork, the team looks ahead to Nov. 4, when they will play for the University Athletic Association (UAA) Championship in St. Louis, Missouri against the University of Rochester.